Some example sketches for a 2.8 TFT Shield touch screen: A numeric keypad, a basic paint program, an image viewer and a calculator. The shield comes with an SDcard slot. The image viewer reads images from an sdcard. Tested on both an Arduino Uno and a Leonardo. The example “tftbmp” reads an image from an an SDcard in the SDcard-slot. I had various results with SDcards: some worked, some did not work. It seems that cards of type “SD2” work, and type “SDHC” not. Update: SDHC cards can be used if you switch to the SdFat library. The example “tftbmp_sdfat” uses this library. To test the card, use the sketch sd_test.ino (part of zip-file) or SdInfo from the SdFat library examples (File > Examples > SdFat). It also displays the card type. If it does not work, make sure the microSD card is formatted in FAT16*. 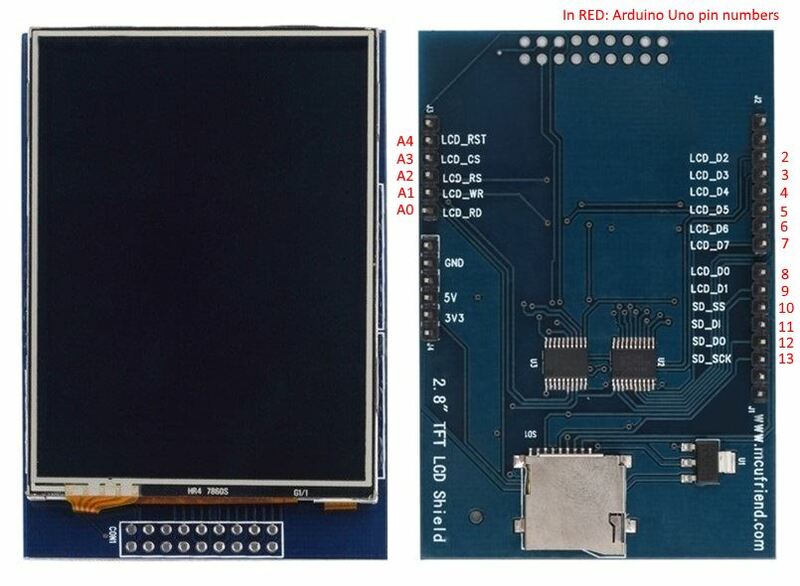 On your computer, copy the images from Arduino\libraries\Adafruit_TFTLCD\bitmaps to the card. Eject the card and insert it into the slot of the TFT Display module. Open the example “tftbmp” (from the zip-file). Start the Serial Monitor (if nessessary, adjust baud rate to 9600) and check the output. If you get “File not found” errors, check the card*. * check the card with the sketch sd_test.ino. If the card is not readable, you might have to format it in FAT16 and add a 4Gb partition. select disk 1   /* MAKE SURE YOU SELECT THE PROPER DISK!! !